QEM-ARMS mineralogical results on a blend of CN1 and CN2 indicated that 67% of silver grains is are contained within quartz, feldspar, willemite (Zn2SiO4), and as free silver grains. Results from analysis CN3 indicate that 52% of silver grains areis contained in quartz and feldspar (see table below). "We are greatly encouraged with the preliminary metallurgical results for Margarita" commented Ruben Padilla, Vice President of Exploration for Sable Resources. 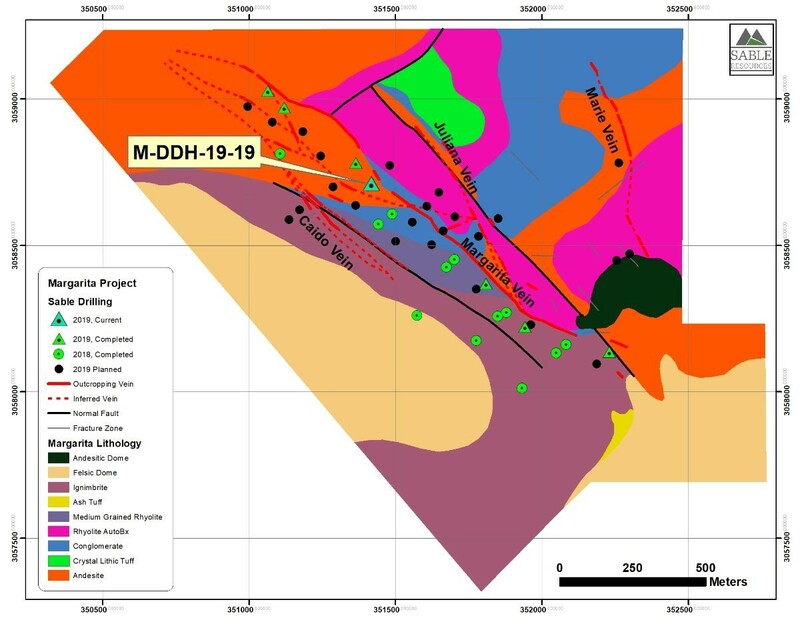 "Receiving indications that the silver is leachable and not refractory at this early stage of exploration gives us confidence in rapidly progressing to the next stage of drilling at Margarita. We have already initiated a second metallurgical test with a -2mm sample size to test the effects of grain size on leachability. Our next steps are to progress to testing 1/4 and 1/2-inch particle size. " At the time of this release 6 holes have been completed (M-DDH-19-13 to 19) with every hole successfully intersecting the Margarita structure and associated veining extending the structure along strike from 750m to 1200m. Hole M-DDH-19-14 received the best vein intercept of 12.4 meters from 30.9m to 43.3 meters. "We are excited to be moving to the next stage at Margarita." commented Tom Obradovich, President & CEO of Sable Resources. "Following our highly successful first round of drilling where we were able to identify thick high-grade silver intercepts, this next round is designed to extend along strike continuity and test the other veins parallel to Margarita. Early indications are excellent with hole M-DDH-19-14 already showing a vein intercept of 12.4m."